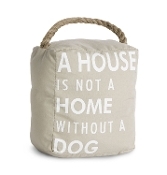 No couch or bed is complete without a few decorative throw pillows. Enclum's hearth products are constructed of Enclume's signature hammer steel. Combine this finish with hand-forged rolled ends, bias-bent arches and other exclusive features and the result is distinctly Enclume. 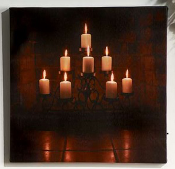 Brighten up your den and hallways with our selection of lighted wall art. 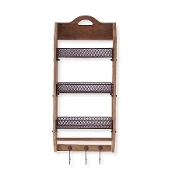 Adorn your hearths with these American made log racks. 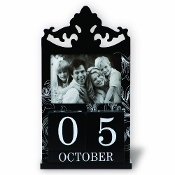 Open door decor is a line of high quality door stoppers by Pavilion Gift Company. 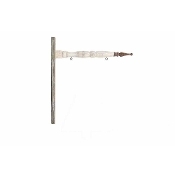 12.5 Inch Rustic Barn Board Arrow for Inter-changable Decorative Plaques and SignsWooden arrows can be used inside your home or on a covered porch and are designed to be used with any of our hanging signs.Glass Vertical Double Picture Frame with Metal Trim. 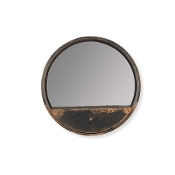 Decorate your living room or bathroom with this black metal round mirror. 3 Little Piggies Tabletop Mirror Three little piggies are looking at their own reflections. Decorate your home with this tabletop mirror. 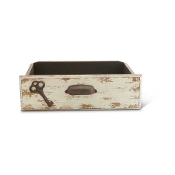 With a weathered finish, this is sure to fit into a farmhouse styled decor. 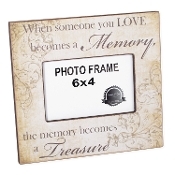 6.4" x 4" mirror Size: 8.5" x 1.9" x 6.4"
4-Pocket Black Framed Keepsake Frame Display your most precious memories from your life with this 4-pocket keepsake frame from Giftcraft. Measuring 14.8" x 15.8 and meant for hanging on the wall Size: 14.8" x 15.8" x 1.2" Black frame with Glass top. 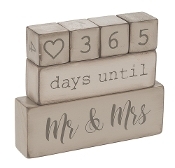 4-Pocket This adorable little countdown calendar is the perfect gift for your favorite newly engaged couple! 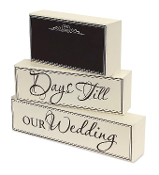 The stack-able 6 piece set allows you to count down to that beautiful day! 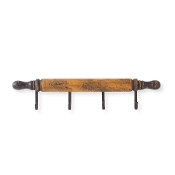 Rustic Barn Board Arrow for Inter-changable Decorative Plaques and Signs These assorted hand towels will be a great addition to any environment. Each set includes a towel labeled Blessings, Cherish, Faith, Family, Friends, and Home. Cream with Antiqued finish Angel Figurine with heartfelt bereavement sentiment messaging and mosaic glass angel wing detailing. Multi-Color Tufted Coir with non-skid PVC backing Doormat. 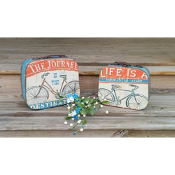 Bicycle Decorative Lunchbox Journey Cases, Set of Two Display your mementos from past vacations or adventures with these journey cases. 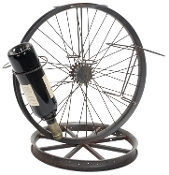 Made with blue canvas-like materials and decorated with bicycle designs and heartfelt sentiments A rustic bicycle wheel wine rack. 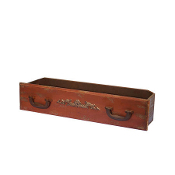 Made from metal and with a rustic and antique theme. What's on your bucket list? write down your bucket list goals and keep them near by as a reminder to continue reaching for your dreams. 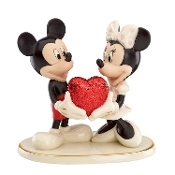 Perfect keepsake or gift! Preserve photos or heirloom recipe cards and record family specialties, preparation tips, and recollections of special meals shared. Takes refills QPM and QPMJ. Camping: where you spend a small Fortune to live like a homeless person. It seems that most cat people are proud to be cat people. With distressed metal and cedar design, this wall plaque is sure to bring some chic to your home or office. A cute ceramic Christmas tree statue from Transpac Imports. With leds for ornaments and cute little snowmen in santa costumes, this decorative tree is sure to bring some Christmas cheer to the home. A ceramic lighted Christmas tree from Transpac Imports. Made from ceramic and lighted with bright LEDs. 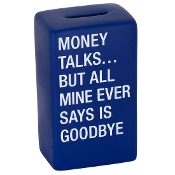 Decorate your home today with this cute piece. Cerdar Wooden Sentiment Cross, 2 Separate Designs Chalkboard Stand, 3/Asst. Keep god close to the heart with this tabletop decorative cross from Giftcraft. Chalkboard signs for your home! 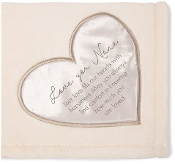 The most comforting gift in the world is your love... and our comfort blanket. A cute set of four snowman figurines from Transpac Imports. 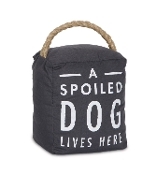 A perfect choice if you want to decorate your home this Christmas. 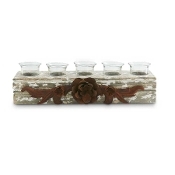 Decorate your home with a beautiful mallard design wine cork holder. Keep that baby picture! They grow up so fast! 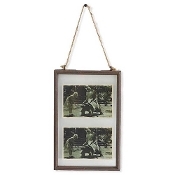 You'll always remember your baby with this sentimental photo frame from Ganz For over 70-years, Gift craft has earned the trust of retailers and consumers worldwide. 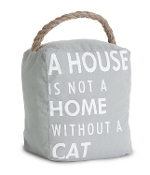 The Homestead Cat Design Door Mat. Gray mat design features a cat sitting on a wooden fence with Welcome sentiment, and flower and leaf design detailing in the background. Made of rubber. A rustic brown sculpted iron beer cap holder. Embosses with "BEER CAPS" plate design. Glass Fish Design Vase, Choice Of Three Different Colors // A cute fish design flower vase. More information Size: 3.8x2.6x10.2(in) Three colors: Turquoise, Blue and Green Perfect for holding flowers or just as simple decoration About Face Designs have fun and clever gift items, made of high quality materials. 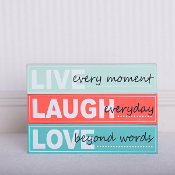 Choose from a variety of humorous to encouraging sentiments with vintage flare. Green Polystone Multi-Frog Holding Sign Statuary. Hop On In. Cute black bears embracing on the 'O' adds charm and appeal to any home. Measures approximately 11.75 x 2.75 x 6.5 inches. 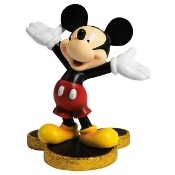 Perfect for display on a shelf or mantel as a decorative statement piece. Decorate your front porch with beautiful glass and metal solar powered butterflies. 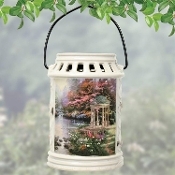 Light Your Way Memorial from Pavilion Gift Company is a beautiful line of home and garden treasures created to keep our loved ones' memories alive while brightening our hearts and home. Memorial Collection Large Resin Angel Design Figurine. Memorial Collection Cream Colored Painted Resin Memorial Photo Frame with metal gold butterfly detailing and elegant gold typography sentiment. Memorial Collection Large Resin Angel Design Figurine. Painted cream with gold frame and black sentiment. 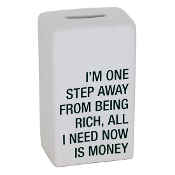 Novelty piggy bank from About Face Designs Save your change with this novelty piggy bank. With bold black and white ceramic piggies. 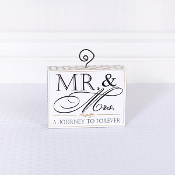 Open door decor is a line of high quality door stoppers by Pavilion Gift Company. 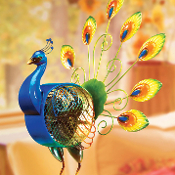 Open door decor is a line of high quality door stoppers by Pavilion Gift Company. The soft neutral colors, lace patterns, silver detailing and beautiful white flowers, make each piece the perfect addition to any home. 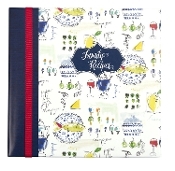 Perfect for home, school, or office, LANG spiral bound hardcover journals are a stylish, yet practical way to record notes. Romero Britto Colorful Pop Art Desk Clock Shadow Box, Please Leave Your Wishes For the New Mr. & Mrs.
Romero Britto Colorful Pop Art Desk Clock Glass Round A New Day design Wall Clock from iconic pop-artist Romero Britto. Features his signature use of vivid color and bold graphic design. Gift Boxed. Requires 1-AA Battery, not included. 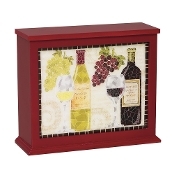 Romero... Decorate your home with this shadow box from Giftcraft. Sports Ball Piggy Bank. Cartoon Face Detailing. Choose From Baseball, Football, or Basketball. Polyresin. Approximately 4 to 5" tall. Stainless Steel and Nylon Straw Cleaner Brush Assortment. 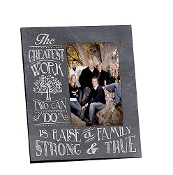 Tabletop Cutout Family Inspirational Photo Frame, 4" x 6" Photo Celebrate your family with the memories and portraits of days gone by with these beautiful rustic and sentimental photo frames from K&K Interiors. Holds a 4" x 6" photo Rustic Designs Three different motif styles Collection celebrates baby's arrival with soft pastel designs, and heartwarming and humorous sentiment messaging. 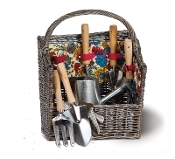 Transpac imports offers a line of gifts and decorative accessories in the Garden, floral, and holiday categories, with merchandise for every occasion. 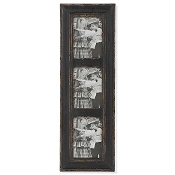 K&K Interiors Black Weathered Wood Vertical Picture Frame. Frame features three 5x7 photo openings. The finish is weathered and vintage. 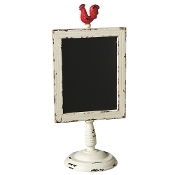 A perfect fit for farmhouse, cottage, vintage and French decor. 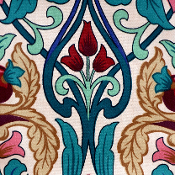 Product size is 27"H x 8.75"W.
From the mountains of North Carolina, manual WW weaves, sews, prints, and develops not just the fabrics, textiles, and beautiful products you'd expect from a Heritage company, they bring you the freshest designs for your home. Put this statue in the bathroom as a friendly reminder! 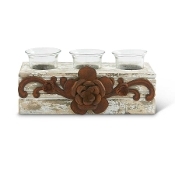 A cute set of coffee themed wooden block tealight holders from K&K Interiors. Each block has it's own unique coffee sentiment. Today's menu, a chalkboard pan help by a polyresin chef statue. 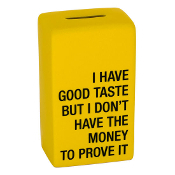 A perfect decoration for you kitchen counter. 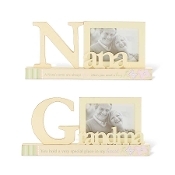 Gift Craft "The Greatest Work" Photo Frame For over 70-years, Giftcraft has earned the trust of retailers and consumers worldwide by offering a diverse array of on-trend decor, jewelry, apparel, accessories and giftware at competitive prices.... This drawer shelf is perfect for organizing in your home. 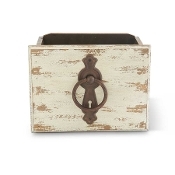 Place on to of your vanity or dresser to put knick knacks and trinkets that have no other defined storing place. Wine! Because No Great Story Ever Started With.... Salad is boring, wine isn't a crime. 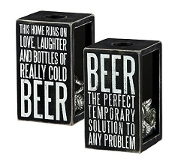 This cute novelty wall sigh can sit on a flat surface or be mounted to the wall Great gift item for that special bar. All wood. 8" wide, 6" high, 1.75" deep. 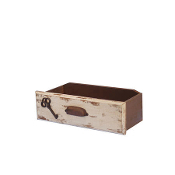 Great storage, vintage vibe - a perfect solution for bath, kitchen, mudroom, wherever! The combination of wood and wire brings a sturdy farmhouse sensibility to modern storage problems. 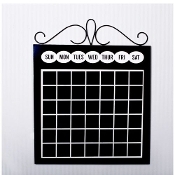 Are you looking for a calendar that you can use for more than one year? Look no further! Size: 4." x 2.8" x 4"
Giftcraft Note to Self Motif Wall Plaques A beautiful collection of Note to Self novelty wall signs with heartfelt messages and sentiments. 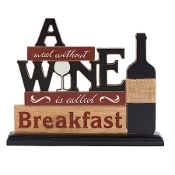 Motivate yourself daily in your home or office with these wooden wall signs from Giftcraft Size: 9" x 12"
A perfect addition to a bar or wine drinking setting. This sign reads "Good wine, Good Friends, Good Times"
Sign reads: "Good Wine, Good Friends, Good Times"
Pavilion Gift Company, Retirement Stoneware Mug, 12-Ounce Capacity // Celebrate the moments that last a lifetime with this beautiful and classic collection which includes mugs, wine glasses, photo frames,... There is nothing better than seeing your families faces. 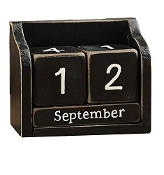 This perpetual calendar is the perfect way to keep track of your days and to keep your family in your thoughts before you leave to tackle the day. 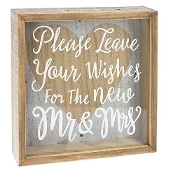 Perfect for hanging in the kitchen or foyer! This chalkboard is perfect for hanging from your door as a way to leave messages for house mates or dorm roommates. 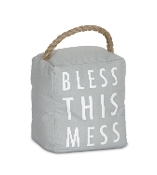 Hang in your laundry room or anywhere a message needs to be displayed! 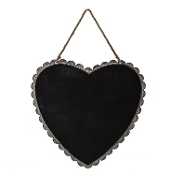 A big heart shaped chalkboard from Design Combined Inc. Make sure people know whats up when you're not around by hanging this on your bedroom door or anywhere in your home. 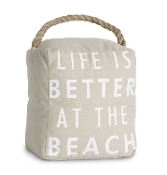 A perfect holiday, or birthday gift for your grandmother. A white vase adorned with a Grandma motif and pink flowers. 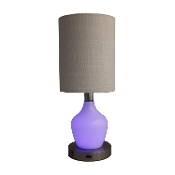 A stylish way to brighten up any room. Wanderlust, Bless This Home Vase Reminiscent of the 70's and 60's, this vase is modeled after a mason jar, but ready to hold you next valentines day set of flowers or can be a perfect birthday gift for a special lady in your life. 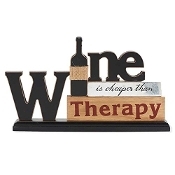 Size: 6.5" tall, 3.75" Diameter Reads: "Bless this Home"
Tabletop wine therapy desk sign. 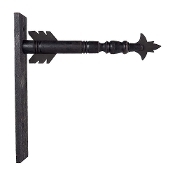 Wood and Metal Chalkboard Wall Hook A white motif chalkboard with two hooks. 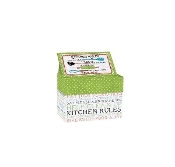 Hang in your kitchen or foyer for an easy way to leave memos for the family. 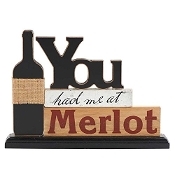 Useful for placing in your foyer or kitchen for car keys, hats or light jackets Size: 11/8" x 3.2" x 16.3"
You had me a Merlot tabletop novelty sign.